I have a crab that has been hanging near the saltwater dish for the last week. He's never very far from it. He's also spending a lot of time eating the eggshell that I put close to the saltwater. His eyes aren't cloudy, but he's missing a leg. I don't know where or when that happened. I cant help but think he's preparing for a molt. The only other crab I've had that dropped limbs was a rescue that got here, surface molted, dropped legs and died. It never made it out of isolation. So, the question is, should I isolate him? Our last rabbit managed to chew up all of our heat mats cords so right now my best iso is a KK inside my main tank. I have not had a cannibalism problem to date and have always allowed healthy crabs to molt in the main tank undisturbed. Are there any special premolt foods I should make available? So long as you have enough (and proper) substrate & tank conditions, there should be no reason to isolate a (soon to be) molter. I honestly don't even know why people suggest it, because any time a crab is put into a new environment it becomes a little more stressed. As molting is a delicate cycle, we want to be sure to put as little stress on them as possible. For the food, if you feed a healthy varied diet regularly you shouldn't need to go out of your way to make anything special. Calcium & protein are always important. I like to make sure I always have some form of high energy food in the tank for molters (since I have so many crabs, that's all of the time) - things like fruit (fresh, dried - doesn't matter, really), bee pollen, peanut butter mushed with something like oats to make it non-sticky. Yes, I agree with @emberfusion. I don't isolate molters and never have. Does he show any other pre-molt signs such as ashy exoskeleton, puffy exoskeleton, lack of obvious hair & follicles? With the leg loss, he may be just trying to prompt an earlier molt to make the repair. So yeah, if you have good conditions and substrate you shouldn't need to isolate molters. No. No ashy or puffy exoskeleton and his legs are hairy. The food available is a pretty good variety. My thoughts are the same about isolation. I don't want to stress them by moving them to new surroundings. Up until now I have only used isolation tanks for newcomers and I have been happy with that. I asked because I still consider myself in the learning stage even though I've had hermits for almost 4 1/2 years now. Okay, yeah if he's hairy then he may be trying to push for an early molt to fix the leg. Well, it looks like he's gone down. I haven't seen him since late last night. I am sure if he has recently lost a leg he was just trying to begin to molt again to repair it. I had a crab that somehow came up from a molt missing almost all legs, and the ones he had were all twisted. I suspect it was an interrupted molt by another crab. He started preparing to molt again right after he came up. Now I did ISO him but that was due to the fact that I wanted to monitor him since he could barely walk. I do not normally ISO crabs at all. It normally causes too much stress for them. Hopefully everything goes well for him. I can see where isolation in that case could be better in the long run. How did he come out of it? Did he molt on the surface or was he able to dig down? He did kind of a half burrow thing under a coconut hut. He came out looking great. His regrown legs were noticeably skinny than the others but he looked lovely other than that. He also seemed very appreciative after that. I'm looking forward to seeing this little crab come up with a new leg. 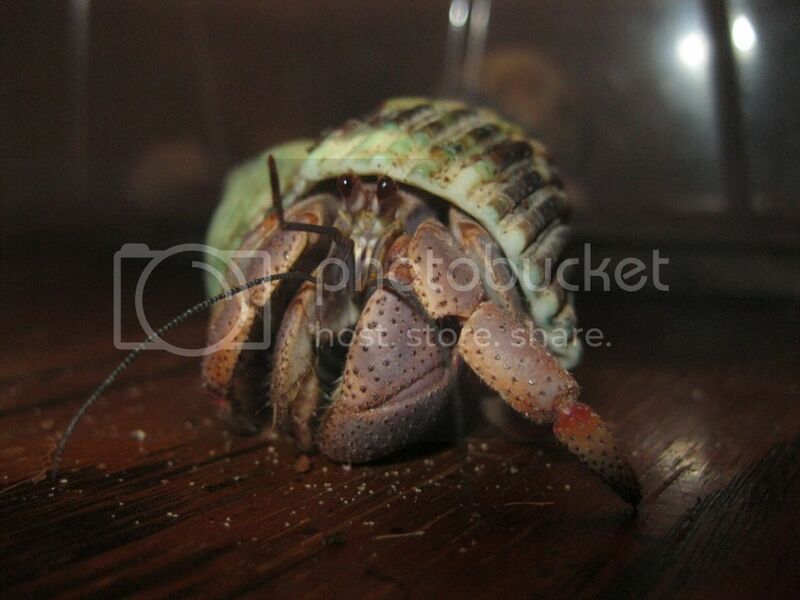 Hopefully he won't come up and change shells before I see him. You should be able to find him once he comes up. The majority of the time, it usually takes multiple molts to fully regrow a lost limb back to normal size. I didn't realize that. Thanks. Now I'll have maybe 3 crabs that I can tell apart. They all started out with names, but the kids changed names and the crabs changed shells and I gave up trying. He showed himself in his usual spot again last night and proceeded to eat every piece of coconut I had put in the tank. He's back down again now. They are such interesting funny little creatures. Yeah.I only have few crabs that still have their names. The others have names but I am unsure of which name goes to which crab. Heheh. Yes you should be able to tel. My guy's new legs were smaller and skinny compared to the originals. It looks a bit funny at first.